There was a reversal in roles at Sheffield Hallam University when the Swann-Morton team took over the theatre training suite to create a stock of photographs to be used within their new online Sharps Safety Training programme set to be launched later this year. 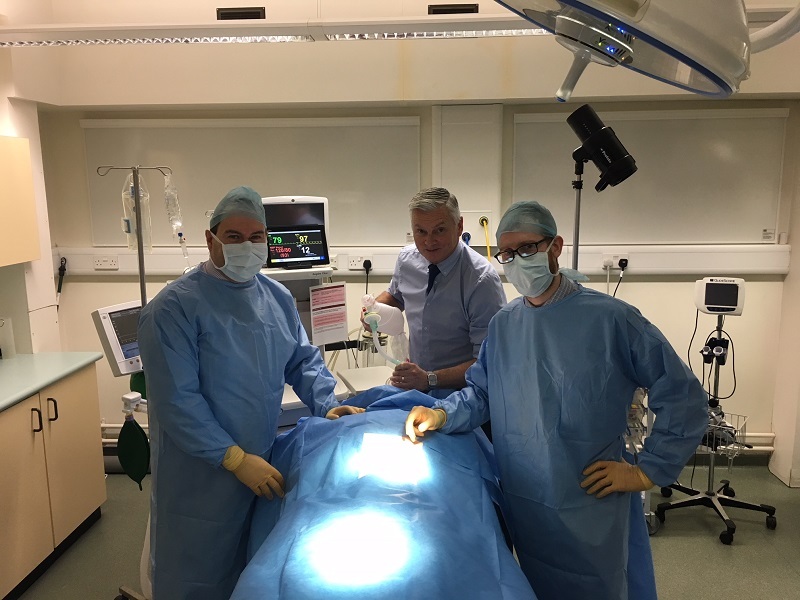 Under the watchful eye of the ODP course leaders, Adrian Glossop and Tom Caley were gowned and gloved in line with existing protocols before taking on their roles as members of the Surgical team. Swann-Morton have an on-going relationship with the Sheffield ODP's including the provision of on-site training in best practice when handling scalpels and blades and a visit to the Sheffield facility to see the blades being manufactured. Sales & Marketing Director Chris Taylor who had to step in to help resuscitate the patient stated , "We would like to thank Sheffield Hallam University for allowing us to use their excellent facilities and we are pleased we are able to assist in the education of future generations of ODP's."